Shapes are used in various industrial fields, including building, civil engineering, shipbuilding, railroad, steel towers, and general purposes.JFE Steel Corporation develops and manufactures high-quality shapes in large shape mills of the Kurashiki and Fukuyama Districts of the West Japan Works, and in shape mills of the Himeji Works of JFE Bars & Shapes Corporation, which is a group company. We offer shapes with a wide variety of sizes and steel grades, high accuracy of dimensions and geometry, high functionality, and high efficiency of construction that have been achieved by introducing advanced technologies for shape manufacturing processes, such as Super-OLAC S and rail on-line heat treatment equipment. Wide flange shapes with sizes in inches and millimeters, very large shapes with a web height of 1000 mm, wide flange shapes with extra thicknesses for the foundations and columns of high-rise buildings, and so on. 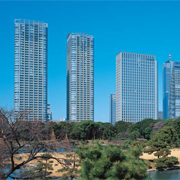 Various shapes made by JFE Steel are widely used for building. 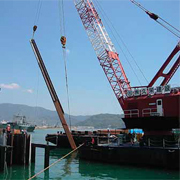 Steel sheet piles are widely used for civil engineering, including river embankments, quay wall of ports, retaining walls, cuttoff walls, and seismic strengthening. 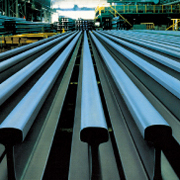 JFE Steel offers products that meet various needs. 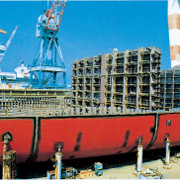 Shapes designed for ships, such as tanker, balk carrier and container carrier, the JFE Steel Group offers a wide variety of shapes and sizes. Regarding many steel grades for mild steel, high-tensile steel, steel for law temperature service, we obtained approval for various standards of ship classification society. JFE Steel manufacture rails that meet the standards of foreign countries. For curved sections and railroads with high axle loads, JFE Steel also manufacture on-line heat treated rails to achieve an extended service life. For finish rolling stand, variable-width horizontal rolls process, which allowed free width adjustments, were introduced. By means of these rolling process, we manufacture Super HISLEND wide flange shapes with uniform web heights and flange widths, which are outside dimensions, and meet new design needs for construction.